The Battle of Towton took place on Palm Sunday in 1461 and was one of the grisliest battles of the Wars of the Roses (1455-1487). That conflict was so bloody that it’s estimated that tens of thousands of soldiers were massacred. In 1996, a mass grave unearthed near the battlefield that contained the skeletal remains of some of these men, and these bones now help archaeologists research medieval battlefield injuries. The historical events that lead up to the Battle of Towton are so notorious that they have inspired books and television shows. George R.R. Martin has said that the Wars of the Roses inspired The Game of Thrones, the first in a series of fantasy novels about a dynastic war among several families for control of the throne of the fictional kingdom of Westeros. The Wars of the Roses were a string of English civil wars fought between two houses of the Plantagenet Dynasty, the Lancasters and the Yorks. Like the wars fought in A Song of Ice and Fire, these real-life conflicts were fueled by court intrigue, rivalries, and revenge. FIrst a little background about the Wars of the Roses. Entire books have been written and semesters of classes have been taught about this complex civil war so please excuse any over-simplification. The Wars of the Roses resulted from the collapse of the English government under the ineffective and mentally unstable Lancastrian monarch, Henry VI, (1421-1471) and the economic hardships that followed the Hundred Years’ War (1337-1453). The Wars of the Roses refers to the heraldic badges of each house: the Red Rose of Lancaster and the White Rose of York. Armed hostilities began in 1455 when Richard Plantagenet (1411-1460), the king’s cousin, the Duke of York, and Lord Protector, was forced from court by the Queen, Margaret of Anjou (1430-1482), for advancing his interests and imprisoning his adversaries, who happened to be supporters of King Henry VI. After King Henry was captured at the Battle of Northampton in 1460, the Duke of York asserted his right to the throne. But the nobility were reluctant to overthrow the king so they passed the Act of Accord, which allowed Richard and his heirs to inherit the crown after Henry’s death. Unfortunately no one consulted the Queen who had some definite thoughts on the matter. Margaret of Anjou refused to accept any agreement that deprived her son of his right to the crown, so she fled to Scotland to gain financial support for her cause while her commanders to the south continued to fight on her behalf. While the Queen was in Scotland, the Duke of York and his army marched north to meet the Lancastrian forces at the Battle of Wakefield (December 30, 1460), but Richard was lured into a trap and was killed. The Duke’s head was reportedly impaled on a spike and displayed on the York city walls with a paper crown. Richard’s eighteen- year-old son, Edward (1442-1483), took his place as the leader of the Yorkist forces. King Henry VI was freed after a subsequent Lancastrian victory at the Second Battle of St. Albans on February 17, 1461. This cross commemorates the Battle of Towton in 1461 during the ‘War of the Roses. Image Credit: Stuart and Fiona Jackson via Wikipedia. On March 29, 1461 the Lancastrian and Yorkist armies met on a field between the villages of Towton and Saxton near York in northeast England for an all-out, winner-take-all confrontation. Historians dispute the exact numbers of those who fought and were killed that day. It’s estimated that between 50,000 and 80,000 soldiers took to the battlefield, and at least 20,000 perished. In comparison, between 7,000 and 8,000 Union and Confederate soldiers died at the Battle of Gettysburg, one of the most brutal battles of the American Civil War. Though the Yorkist army outnumbered the Lancastrians, they were victorious and Edward became the King Edward IV of England. Warrior holding a pollaxe in the coat of arms of Alytus County, Lithuania. Image credit: Wikipedia. Written records and carefully mapped artifacts have helped historians piece together the events of that day. The Yorkist archers reportedly hit their targets but the Lancastrian archers fell short and were forced into hand-to-hand combat that lasted for hours. This combat was particularly brutal because a soldier’s weapon of choice during this period was the pollaxe, a piece of equipment designed to penetrate armor. The head of the pollaxe consisted of an axe, opposite the axe was a spike or hammer, with a dagger projecting from the top. Construction workers stumbled across a mass grave containing the casualties from the Battle of Towton during home renovations in 1996. The grave was carefully excavated and documented by archaeologists from the University of Bradford and the West Yorkshire Archaeology Service. The location of the grave, which is about a half a mile from the battlefield, and carbon dating link it to the Battle of Towton. This is the only mass grave of a known medieval battle found in England. The exhumed bones tell the story of men who lived hard lives and died in a grisly fight. The remains of 38 individuals, including 28 complete skeletons, were recovered. The bodies recovered from the Towton mass grave belonged to men who ranged in ages from 17 to 50 years old; and had heights that ranged from five feet to six feet, with the older men being the tallest. Researchers from the University of Bradford believe these bones belong to members of the Lancastrian army because the bodies were found in a mass grave and there were no grave goods associated with the bodies. Many of the skeletons had perimortmen injuries, trauma that occurred around the time of death, and some had healed wounds from previous fights. Most of the trauma was to the skulls: 113 wounds on the 28 recovered skulls, and a total of 43 postcranial (the bones below the skull) injuries on all 38 bodies. An osteological exam of the skull wounds suggest that 73 were caused by sharp force trauma, 28 were produced by blunt force trauma, and 12 were the result of puncture wounds. Archaeologists believe that a weapon consistent with the pollaxe could have easily made these injuries. The body with some of the most severe injuries is known as Towton 25. Towton 25 got his nickname from the order in which his bones were removed from the grave. Towton 25, who was between 36 and 45 years old at the time of his death, sustained eight wounds to his head. Osteologists can recreate the order in which Towton 25 received his injuries because of the direction and pattern of his skull fractures. The first five blows were by a bladed weapon to the left side of his head and were surprisingly not fatal. The soldier sustained another blow to the back of his head that opened a large horizontal gash, causing other radiating fractures down the base and sides of his skull. The bone fragments embedded in his brain would have likely caused his death. 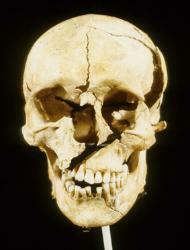 Towton 25 received another wound that cut through his face from his left eye to the right side of his jaw (mandible). The House of York defeated the Lancasters at the Battle of Towton and Edward was crowned King Edward IV, who ruled for 22 years until his death in 1483. After King Edward IV’s death the Wars of the Roses resumed. King Richard III (1452-1485), who was King Edward IV’s brother, assumed the throne and reigned from 1483 to 1485. But Richard III was killed at the Battle of Bosworth Field and was the last king of the House of York and the Plantagenet Dynasty. Henry Tudor, the Lord of Ireland, claimed the throne through distant Lancasterian relatives and became King Henry VII (1457-1509). He married Elizabeth of York, the daughter of Edward IV and niece of Richard III, to unite both houses. Henry VII was the first king from the House of Tudor and father of the notorious King Henry VIII. The civil war continued for a couple years into King Henry VII’s reign because he still had to deal with Yorkist challengers. The Towton Skeletal Collection, now housed at the University of Bradford, is important to archaeologists because it is a good resource to study perimortem battlefield injuries and the effects of medieval battle on the skeleton. Pinhasi, R. and Mays, S. (Eds.). (2008). Advances in human paleopathology. West Sussex: John Wiley & Sons.